Today we cycled from Aschach to Ybbs. Our zimmer in Aschach was a room in a family home, one of two rooms that are available for radlers (riders on the Donauradweg). The first part of the route took us along a flat and open section of the river valley. We arrived in Linz before 10am and were happy to find free WiFi in the stadtplatz. Public internet access is not easy to find and unsecured WiFi is rare. According to Fabian, it used to be more widely available in cafes and other public places, but people would camp all day with their laptops, so it has tightened up a lot. Travelling as we are, we have little time and energy to seek it out. Once we leave Austria it will probably be harder to check emails and update the blog. We ate linzertorte and apfelstrudel before continuing. The weather was fine and warm and the cycle path full of cyclists with roller blading, Nordic walking and cross country ski training also featuring. 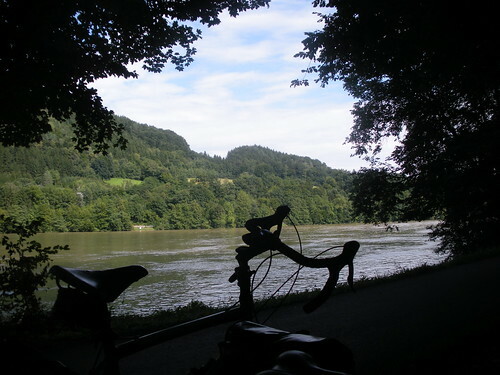 We spent a bit of time getting slightly lost as we crossed the Enns, and found the Donau again near Wallsee, a pretty town with square on top of a hill and a fountain with cherubs Soon after this the gorge closes in again and the path returns close to the river. We are reading Patrick Leigh Fermor who walked here in the 1930s. If we run out of money, Ian intends to do sketches as PLF did to keep himself solvent. Only Ian says he will use the available technology to make it quicker and to produce a better likeness (digital camera and Gimp for various hand-drawn effects). This entry was posted on 12 August 2010 at 8:35 pm and is filed under Austria. You can follow any responses to this entry through the RSS 2.0 feed. You can leave a response, or trackback from your own site.